Our local sports stadium in Seattle sell tossed oil fried french fries in chopped fresh garlic and parsley. I am going to try this and other variables. Beth! I would click on a link titled “OMG! They’re Crunchy! 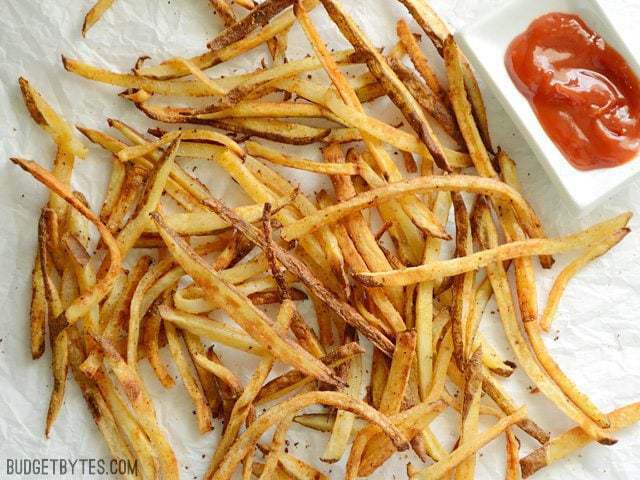 Fries” in a heartbeat!! Hello Beth – I came to you via “cooking blog.com” originally for your ‘baked zuccini’ and they advised to go to your own blog for instructions, but alas, I cannot find the recipe there. Nevermind! :) I found this supersite instead – and immediately pressed “follow” – so here I am. Brilliant – will need a whole day to study everything :). Off to kitchen now to make those fries for husband – moorish, they are. I love this blog! Every recipe has been easy to follow, uses items already in the pantry and has become a favorite place for last minute ideas for the age old “what’s for dinner” question. 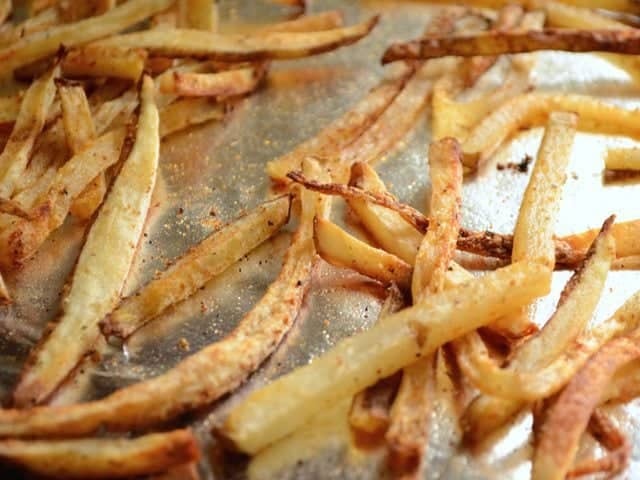 I am sharing this tip from another site, as I have made it several times and not only does it shave time, but the forthcoming crispness of the finished fries is pretty close to the original double fry method! 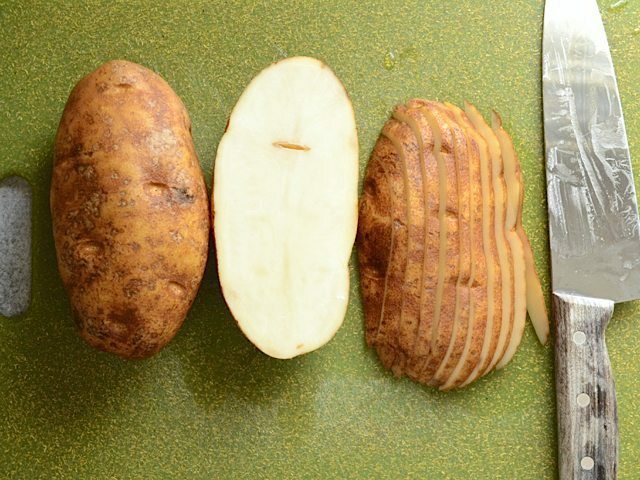 Slice potatoes as described, put in microwave for 3-5 min, covered tightly with plastic wrap. Remove, drain on paper towels and mix with oil, cornstarch and season of your liking. Meanwhile preheat a pan with a few Tbs olive or veg oil in oven to 450. 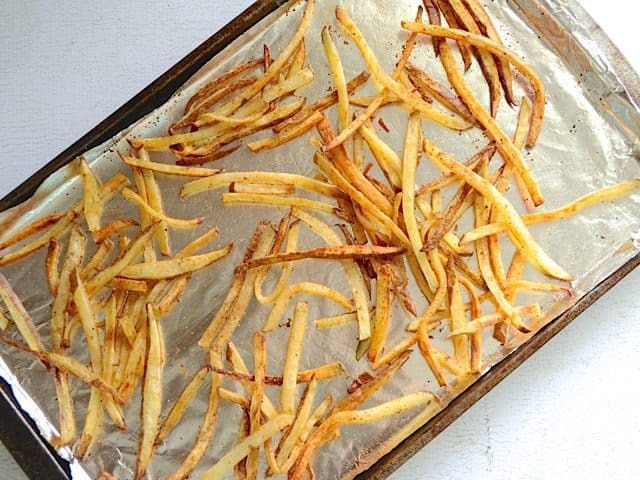 Place potatoes on sheet and bake Btwn 18-25 min depending on thickness….makes very crispy oven fries! We have made these 4 times now! My family and I love them and they are such a easy side dish. The smoked paprika I have is the hot variety, so I use a little less. I have soaked them in cold water because I had time earlier in the day to cut them up and it didn’t seem to make any difference in how they came out. Some fries will be very crispy, some will be softer. I did find that they do not work as well in a lower oven temperature when I was trying to bake something with them that needs a lower temperature, but they did share the oven with homemade chicken nuggets, For the last half of cooking, and both came out wonderfully. This were way better than my usual “fries” (strips of soft baked potato, ha). I’ve found the best dipping sauce for fries, either regular or sweet potato, is mayo mixed with a pinch of salt, dash of onion powder, and dash of chili powder. Mmmmmmmm. I do admire your encouraging your readers to practice their knife skills, but I don’t feel that it’s especially fair to completely omit mention of the proper tool for this job: the mandoline. 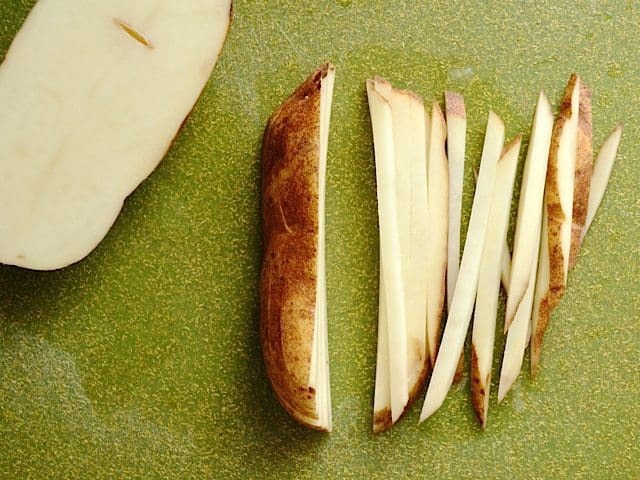 Particularly, elderly or arthritic home cooks might appreciate being relieved of the job of cutting uniform thin potato slices by hand. Professionals value the time savings – even over our relatively good knife skills. 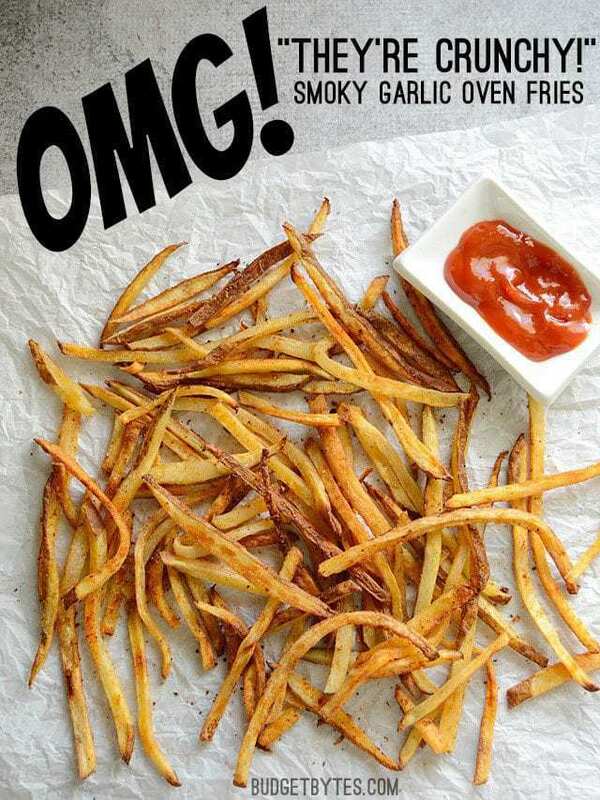 Try one next time you make fries! I AM TERRIFIED OF MANDOLINES. I feel like I’m going to cut my fingers off when I use one with potatoes or anything hard. Just made these. After cooking them for 45 minutes, they were still soft and a little soggy, so I just put them on broil for about 5-10 minutes and they came out nice and crispy! OK, so I must have done something wrong, but I can’t figure out what. Everyone else seems to have had success! I made a half batch, so I used half the seasonings/oil. 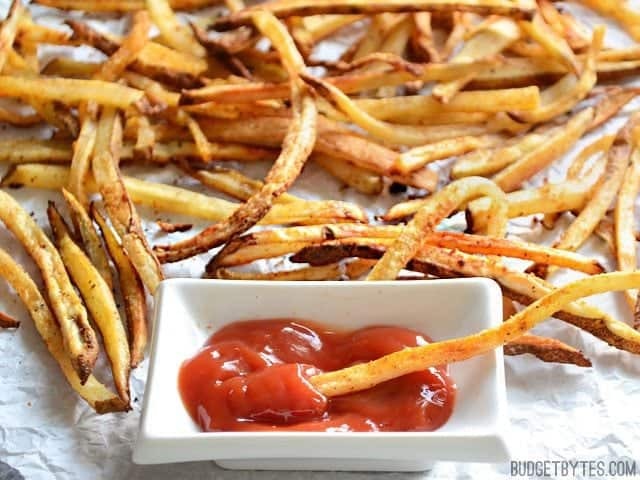 I definitely cut the fries thin enough—they looked just like the ones in the picture. Maybe they were too thin? They cooked pretty unevenly and seemed to go from raw to burned very quickly. Plus, they were not seasoned enough for me. Alas, I am still looking for a baked fry that comes even close to a fried one! Not just you, Ann! I had the same issue… I’ll have to try again sometime. Thanks for the suggestions, Beth! I used my leftover red potatoes and they tasted great. I forgot to spray the foil so messed up a few. I did prep them on Saturday and stored them in water in the frig for 2 days. They kept well and stayed white. 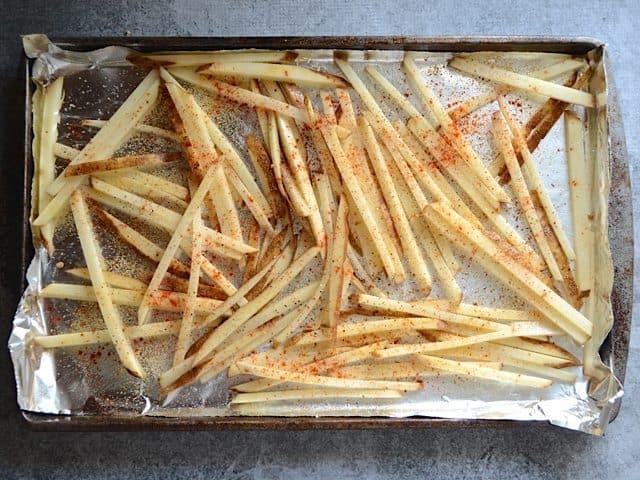 Oven fries are my favorite! I make them all the time. I love this garlic version! These look amazing, I think I’ll try them out this weekend! I’m too impatient to boil them, so I pop a potato in a plastic bag and put them in the microwave for 4-5 minutes (depending on the size of the potato). They come out pretty tender and I cut them up like fries. Then I spray a little oil on them and seasoning, and bake them for 30 min. They come out crispy on the outside and soft in the middle. They’re so good I like them better than the fried version!